I made this cake for my nephew's 2nd birthday. I baked 3 layers, 12, 10 and 8 inch cake. I made fresh strawberry filling to go between each layer. About a week before I molded all of the animals out of fondant and added a tsp gum trag to help them harden. I also made the leaves around the top layer of cake. The cake was iced with cream cheese icing and all accents were made of fondant. Black pieces if fondant were added to give zebra effect on 1st layer, brown squared pieces to second layer to give safari effect. 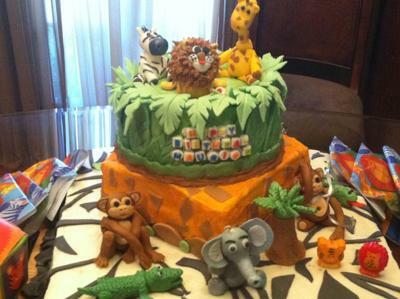 It took about 1 full day to make all the animals and another day of baking and decorating the layers. Needless to say, it was worth every minute cause my nephew loved it. 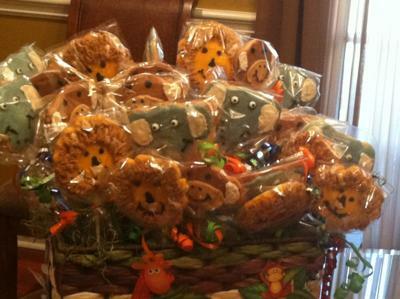 I also made a cookie basket as favors for the kids that complimented the cake.